James Wellbeloved complete dog foods specially selected wholesome ingredients make them naturally healthy, completely satisfying and very tasty for your dog.With no beef or pork, no wheat or wheat gluten, no dairy products or egg, James Wellbeloved complete dog foods are hypoallergenic and free from many of the ingredients which are renowned for causing food intolerances. 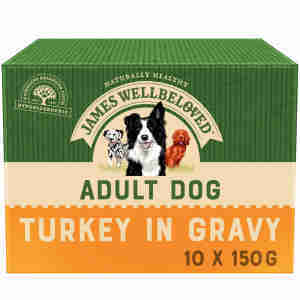 James Wellbeloved Adult Pouches are a complete natural wet dog food which have the added bonus of being hypo-allergenic. Ideal on their own, or as a tasty topper to our dry food. Only lamb or turkey is used as a meat protein source, plus easily digested rice and vegetables to reduce the risk of food intolerance and digestive upsets. Added extra ingredients such as alfafa, seaweed and linseed also aid digestion and soothe itchy coats. James Wellbeloved Adult Pouches are made to the same high standards as our dry food, which means that you can be sure that you are feeding your dog food which it natural, tasty and healthy. James Wellbeloved Adult Pouches are dietetic food that is excellent for the reduction of ingredient and nutrient intolerances.